On 20 March 1516, Zaccaria Dolfin, an influential Venetian patrician, announced a radical turn in the history of the Jew of the Serenissima: “It is necessary to send all the Jews (zudei) to stay in the geto novo, which is like a stronghold, and to make drawbridges and to surround it with wall so that there will be only one gate that will need to be monitored, and only the boats of the Council of Ten will stay through the night”. After the council, the senate of the city voted 130 to 44 to enclose the Jews in a specific part of the city. On 29 March, a decree established the first ghetto in an unhealthy, outlying area that was the location of a former copper foundry (geto in Venetian, a plausible source of the word ghetto). Jewish quarter already existed in several cities in Central Europe, but the residential conditions were not as rigorously codified. The “geto” rapidly became famous, its name soon achieving the status of a common noun. The noun “ghetto” appears to derive from the name of the islands where the first ghetto was established, having featured a foundry (geto or getto). Although this etymology is generally accepted, it is perhaps too simplistic and leaves some skeptical, for it neglects to explain the shift in pronunciation from the initial sound “zh” of geto to the hard “g” of ghetto. This gutteralization could be due to the pronunciation of Venetian Jews of the period, who were in large part of German origin. Some scholars have suggested other origins for “ghetto”: for example, from the Hebrew word ghet (repudiation or divorce). Until this time, the Jews of the Serenissimo had had few problems. Some Jews probably lived in Venice as early as the twelfth or thirteenth century, on Spinalonga Island (the reason it has been called Giudecca ever since). However, historians do not agree on this point. 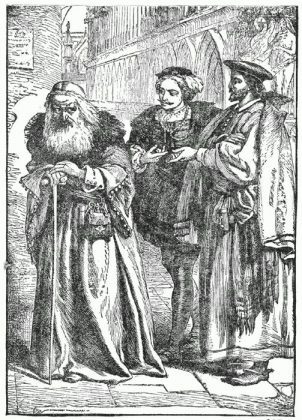 The republic needed money, and at the beginning of the fourteenth century it authorized Jewish moneylenders to settle in Venice. Arriving primarily from Germany, the Jews were forbidden to reside permanently in the city and were forced to wear a yellow, later red, beret for easily recognition. Most Jews chose to live in Mestre or in neighboring cities such as Padua. Beginning 1509, the Jews began to arrive at the Lagoon in greater numbers, fleeing, as did thousands of other refugees, the victories of the papal and Austrian troops allied against Venice. It was in this dramatic context it was decided to create the ghetto nuovo, which held some 700 German and Italian Jews. Then, in 1541, the ghetto vecchio was created for Jews from the Levant and Spain, this last group bing wealthier and engaged in maritime commerce. Among the Jews from Spain were many Marranos. In 1633, a new zone (ghetto novissimo) was added to the area where Jews were permitted to live in Venice. Their rich Levantine or Spanish families settled. 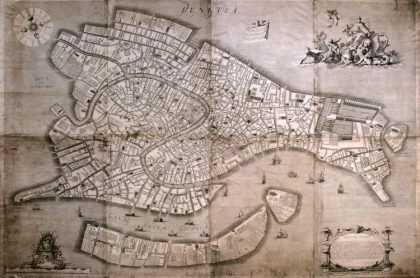 In 1589, some 1600 Jews lived in the ghettos; by 1630 they numbered 4870 people, or 3% of the inhabitants of Venice’s city center, but with a population density four times higher than that of the rest of the city. The walls of the ghetto finally fell in 1797 with the arrival of Napoleon Bonaparte’s troops. This ghetto was both the most infamous and sumptuous in Europe; it has maintained almost totally its original structure. Its five synagogues from the sixteenth and seventeenth centuries are among the most beautiful in Europe. Scarcely 500 Jews live in the city today. A visit to Jewish Venice requires at least tow days. If you cross the small wooden bridge over the Rio del Ghetto Nuovo and then pass beneath a sottoportego (a little arched passageway under a building that is typically Venetian), you can still see the holes in the walls from the beams of the great doors that blocked the passage at night. Emerging from the sottoportego, you immediately find yourself on the large campo (square) of the Ghetto Nuovo, a trapezoidal space with a few trees ad three wells made of Istrian stone that has remained almost unchanged since the time of the ghetto’s occupation. Only the buildings of the Casa Israelitica di Riposo built on the north side in the nineteenth century have replaced the high facades that surround the rest of the campo. These buildings have eight or nine stories and are still among the tallest in Venice. Riccardo Calimani, History of Venice’s Ghetto (Paris: Stock, 1988). The campo was the heart of daily life for Venetian Jews. Here moneylenders set up their tables in front of the houses or under doorways. Although Venice’s Jews excelled in printing and medicine, the rows of strazza (used-cloth) vendors on the square engaged in the other occupation officially permitted to Jews. At number 2911 on the square, one can still see the signboard of the Banco Rosso (which also existed in yellow and green, and so was called depending on the color of the borrower’s note given). Crossing the Ponte delle Agnudi, one passes from the ghetto nuovo into the ghetto vecchio, which has a calmer atmosphere despite boutiques lining its narrow streets. In the past, every evening both ghettos emptied all of their non-Jewish pedestrians and clients before the doors shut on the enclosed Jews. They were forced to pay guards who, on foot and in boats, enforced their confinement. The campo nuovo was the only large Venetian campo without a church or palace to define the space. The Scola Tedesca Grande, or Grand German Synagogue, is located at the southeast corner of the square on the second floor of a tall house with large windows. The Scola Canton and the Scola Italiana were located next door. The ghetto nuovo had its gaze turned toward its main synagogues and the land of Israel. Donata Calabi, La Città degli Ebrei (The City of Jews), with Ugo Camerino and Ennio Concina (Milan: Marsilio Editions, 1995). None of the following five synagogues in the campo of the ghetto nuovo or the neighboring streets can be seen without a guided visit. Constructed in 1528 by Ashkenazic Jews, the Grand German Synagogue (Scola Tedesca Grande) in the ghetto nuovo was the first of the ghetto’s synagogue. The walls of the majestic great hall (46 x 23 feet) appear to be oval, but are actually trapezoidal. They are paneled midway with lovely walnut wood and gilding. 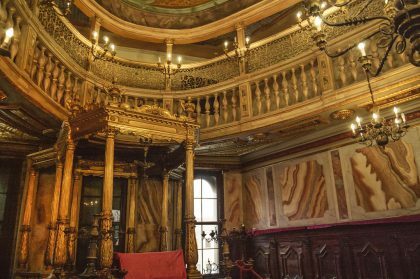 Dating from 1666 and covered with gilt, the raised aron (with the Ark of the Torah) is accessed by four pink marble stairs. The golden bimah with its elegant Corinthian columns is from the same period. The aron and bimah face each other from the short walls of the room. The synagogue was drastically remodeled in the middle of the nineteenth century. In the original layout, the bimah was in the center of the room, as in the synagogues of Germany and Centra Europe, which explains the absence of decorations on the floor in the center of the hall and the octagonal opening in the ceiling. Five large windows inundate the room with light during the day, symbolically representing the five books of the Pentateuch that illuminate the world. Like the other synagogues in the ghetto, this one is on the second floor in order to be closer to heaven and the stars. The Museum of Hebrew Art, opened in 1953, occupies two rooms in the same building as the synagogue. Beautiful silver religious objects, sacred decorations, and interesting manuscripts are on display. The Canton Synagogue (Scola Canton) is located near the Grand German Synagogue. It is easily recognized from outside by its small gilt dome above a wooden square base erected in 1532 by Jews from the provinces. After crossing a long hallway that served as a “room for the poor” (for those who could not afford to pay for the service) at the top of a narrow staircase and passing through a swinging door, you will enter the lovely rectangular hall (43 ft. x 23 ft.) of the temple. The aron and bimah face each other from the shorter sides of the hall. The aron resembles that of the Grand German Synagogue and dates from the same period (1672), but it is even more splendid. With its four-columned classical portal, the Italian Synagogue stands out of the campo of the ghetto nuovo. Its entrance is the same as that of the nearby residences. Constructed in 1575, the large, almost square (36 ft. x 33 ft.) prayer hall of the synagogue is located on the third floor. The worship hall is decorated less lavishly than that of the two mentioned temples. Lit by five windows and a small dome above the bimah, the hall is harmoniously proportioned. Dating from the eighteenth century, the imposing bimah rests on a raised platform reached by eight steps and surrounded by four gilded wood Corinthian columns. With its simple but elegant seventeenth-century facade, the Spanish Synagogue (Scola Spagnola) stands on the Campiello delle Scole in what was formerly the heart of the ghetto vecchio. Established in 1541 for the Sephradic Jews banished from Spain who had subsequently settled in the Levant (levantini) or the falsely converted marranos who stayed on Christian soil (ponentini), the Spanish Synagogue was the first edifice in the ghetto erected according to real architectural plans and not simply a structure adapted to its location. Begun in 1555, the synagogue was remodeled circa 1635 under the influence of the great Venetian arhitect Baldassare Longhena, or clearly one of his students. His influence is equally evident in the structural design and the interior decoration. The handsome aron with its black marble columns is separated from the rest of the hall by a wooden balustrade. It seems to be an almost exact copy of the great altar of the chapel of the cardinal patriarch Francesco Vendramin in the church San Pietro di Castello. At the other end of the large, well-lighted hall of worship (72 ft. x 43 ft.) stands the raised bimah, with two columns supporting a heavily decorated architrave. The rich decoration of the ceiling is particularly interesting with its carved wooden bas-reliefs and its stuccowork in a style close to that of the palace of Ca Pesaro. On the other side of the small square stands the Levantine Synagogue (Scola Levantina), erected between 1528 and 1561 and renovated in around 1680. Although displaying the same architectural influences as the other synagogues, it is even more luxuriant. Decorated with dark wood, the large entrance vestibule contains two doors: one leading to the hall of worship on the second floor and the other down a short hallway to the Luzzato Synagogue (Scola Luzzato), a yeshiva with a gilded wood renaissance aron -the oldest in the ghetto. The synagogue’s prayer hall (26 ft. x 30 ft.) is imposing. The sculpted wood bimah made of black-stained walnut is the work of Andrea Brustolon, a cabinetmaker originally from Belluno whose work was fashionable at the time. The podium, accessed by a double staircase, is crowned with a baldaquin supported by twisting columns of the type thought to have been in the temple of Solomon. The polychrome marble aron at the other end of the room is undeniably simple. Situated between the sea and the Lagoon in what was at the time the desolate outskirts of the city, the old Jewish cemetery is located on the property of the San Nicolo monastery. As attested by its oldest tombstone -belonging to a certain Samuel, son of Samson-, the cemetery opened in 1389. It is difficult to imagine what the cemetery might have been like in the past. Time has bleached the gravestones and erased many of the inscriptions. Some of the stones have fallen over and are overgrown with ivy. The tombstones crowd and overlap each other; some of the sarcophagi are open, the slabs once covering them now pointing skyward. One can still make out, however, the symbols and emblems decorating many of the tombstones, especially those of the great families of Spain or Portugal. The rampant lions or crowned eagles of the Jesurum-Diaz family for example, are still visible. Other stelae bear more traditional motifs, such as seven-armed candelabra, ram’s horns, palms, or hands in the gesture of blessing. The large burials occurred at the end of the eighteenth century, when the new Jewish cemetery opened on Via de Cipro.